Get That #FranklinFriday Feeling and win your office 300 G&Ts. Is your office in some need of that Friday Feeling? Enter our competition next Friday (24th August) for your chance to win 300 G&Ts for your office! 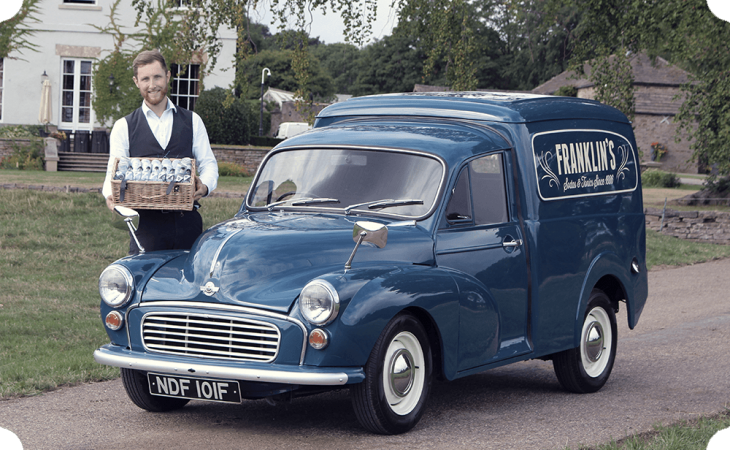 The Prize Includes: You will receive a visit from the Franklin & Sons’ team who will deliver our premium chilled G&T cans created with the finest crafted classic London dry, Portobello Road Gin. We will be making those deliveries Friday afternoon, the perfect way to kick-start the weekend! 1. The promoter is: Global Brands Ltd (company no. 03366749) whose registered office is at Global Brands Ltd. 5th Floor CASA, Lockoford Lane, Chesterfield, Derbyshire, S41 7JB, UK. 2. Employees of Global Brands Ltd or their family members or anyone else connected in any way with the competition or helping to set up the competition shall not be permitted to enter the competition. 4. To enter the competition entrants must be aged 18 or over and will need to upload the Franklin & Sons competition image and tag #FranklinFriday & Their office (company) name. 5. The competition will be live from Friday the 17th of August. 6. Closing date for entries will be Friday the 24th August at 3pm. After this date and time no further entries to the competition will be valid. 8. The rules of the competition and the prize for each winner are as follows:- There will be 10 winners. Each winner will receive 300 Gin & Tonics delivered to their office on Friday 24th of August. 13. Winners will be chosen at random by a judge appointed within Global Brands Ltd. The judge’s decision is final. 14. All winners will be notified by Global Brands by Friday the 24th of August. 15. The promoter will notify the winner when and where the prize can be collected or how it will be delivered and the winner must provide their name, proof of ID, address and postcode in order to receive the prize. The winner must provide the above before Friday 2pm the 24th of August. 19. The winner agrees to the use of his/her name and image in any publicity material. Any personal data relating to the winner or any other entrants will be used solely in accordance with current [UK] data protection legislation (GDPR) and will not be disclosed to a third party without the entrant’s prior consent. 21. By entering a competition, an entrant is giving us permission to use his/her image and name on all of the Franklin & Sons Social Media channels. 22. This promotion is in no way sponsored, endorsed or administered by, or associated with Facebook, Twitter or Instagram.